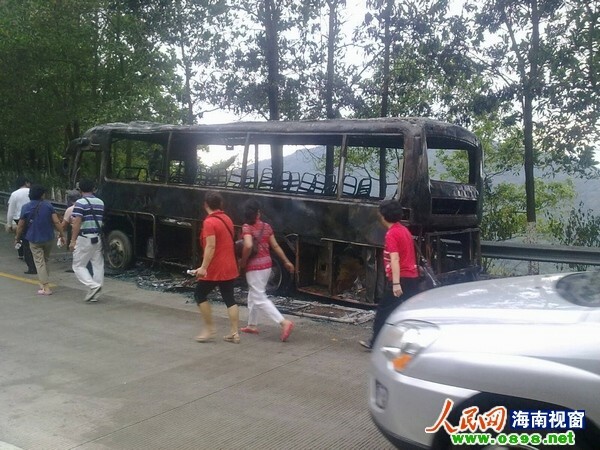 A tourist bus burst into flames at the National Highway 224 in Sanya around 8:30am of February 25. Fortunately no casualties were reported in the accident. The tourist bus, with 30 full seats, was on its way to Yanuoda Rainforest Cultural Tourism Zone. After knowing the bus get burned, the driver took the bus to the side of the road and arranged the passengers to escape from it before the vehicle was engulfed in flames. According to the witnesses, the bus has been pulled to the side of the road, but the incident has left the highway traffic congested for almost one hour. It is reported the cause of the fire was self-ignited.